The 2017 Mini Cooper Hardtop is a 2-door front-wheel drive subcompact hatchback equipped with an economical 1.5-liter (134 hp, 162 lb-ft) turbocharged engine that offers plenty of zip. A 6-speed manual is standard although an automatic is optional but not recommended. A tight interior and firm ride count against it but the quality of the materials used and the engaging handling is a cut above anything else in this segment. Standard features now include a rearview camera and parking sensors as well as a cooled glovebox. The available optional extras set the Mini apart from its competitors with many color and trim options as well as dynamic damper control and parking assist underlining its premium status. 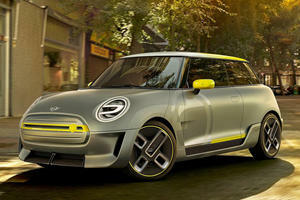 The Mini Cooper has always approached the subcompact category from a more upmarket angle than most. Its latest 2-door hardtop offering is no different with a level of fit and finish generally found far higher up the automotive food chain. 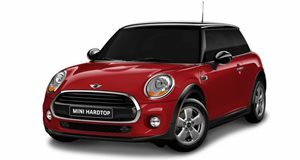 Pricing too is at a more premium level but with the level of customization on offer and new standard features for 2017 the Mini Cooper Hardtop remains a unique offering in its segment. The interior of the 2-door Cooper Hardtop has a number of characterful features that make it feel a bit special compared to the typical cockpit layout you would generally find in this category. Material quality is good and the sheer number of customizations available can make for a very unique car. The wide doors make it easy to get in and out for occupants in the front, the seats too feel supportive and comfortable but the narrow width of the car means that you may be rubbing elbows with your passengers. Being a 2-door, the rear seats require some contorting to climb into and they are really only suitable for smaller children or shopping bags. The cargo area is also tiny but if you use the Cooper Hardtop as a two-seater then the fold-down rear seats make for a useful flat load area. The Mini may be strong on style and flair but the driving experience has always been a top priority too, it retains the sharp and incisive handling abilities of its forebears and is great at zipping around tight bends and challenging backroads. The sporty driving focus means that the ride too can be a bit firm and this is only exacerbated by opting for the larger diameter wheels. Sticking with the manual transmission is also recommended as the automatic is not quite as smooth in city driving conditions as you might expect. 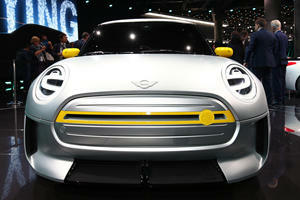 This base Cooper is equipped with a 1.5-liter 3-cylinder engine which produces 134 horsepower and 162 lb-ft of torque. Either a standard 6-speed manual or optional 6-speed automatic transmission sends the power to the front wheels through an electronically controlled limited-slip differential. The lightweight Cooper gets off the line with a lot more verve than the power figures would suggest and a 0-60 mph time of 7.3-seconds marks it out as one of the quickest in its class. The automatic transmission is not quite as capable as some competitor offerings though and the little Mini is far more fun with the 6-speed manual anyway. When it comes to standard specification levels the 2-door Cooper Hardtop comes equipped with a decent amount of kit. Notable features include an electronic limited-slip differential, rearview camera and parking sensors, 6.5-inch central screen with Bluetooth and smartphone compatibility as well as auto headlights and wipers. A range of packages can be added to the basic spec and some notable ones to consider are the Technology Package (parking assistant, navigation system), sport package (LED headlamps, dynamic damper control), Premium Package (Panoramic sunroof, comfort access, upgraded audio system) and the Cold Weather Package (Heated front seats, auto dimming power exterior mirrors). A Fully Loaded Package adds the whole lot together while two JCW Packages and a Mini Seven Edition Package add a range of interior and exterior design changes. Add to this a vast range of exterior paint colors and schemes, alloy wheel designs and interior trim options and you can build yourself a very unique Cooper Hardtop. Shoppers looking for a practical runabout with space for four and a budget price tag may come away unimpressed by the Mini Cooper Hardtop. The sporty ride and compromised rear seats also mark it down against its more mainstream competitors. Those wanting an exciting subcompact that majors on driving fun, offers a premium feel and a wide range of customization options will find their perfect match.